Conductor Overheating: a function of the square rms current per unit volume of the conductor. Harmonic currents on undersized conductors or cables can cause a “skin effect”, which increases with frequency and is similar to a centrifugal force. Capacitors: can be affected by heat rise increases due to power loss and reduced life on the capacitors. If a capacitor is tuned to one of the characteristic harmonics such as the 5th or 7th, overvoltage and resonance can cause dielectric failure or rupture the capacitor. Fuses and Circuit Breakers: harmonics can cause false or spurious operations and trips, damaging or blowing components for no apparent reason. 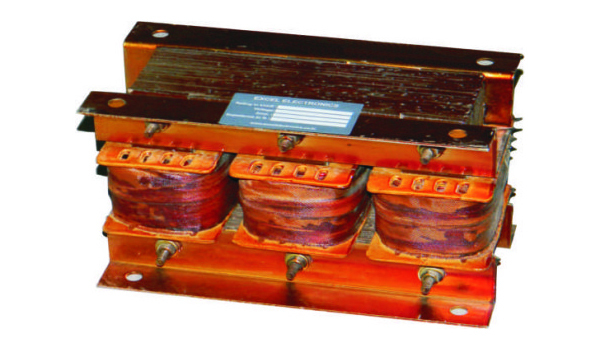 Transformers: have increased iron and copper losses or eddy currents due to stray flux losses. This causes excessive overheating in the transformer windings. Typically, the use of appropriate “K factor” rated units are recommended for non-linear loads. Generators: have similar problems to transformers. Sizing and coordination is critical to the operation of the voltage regulator and controls. Excessive harmonic voltage distortion will cause multiple zero crossings of the current waveform. Multiple zero crossings affect the timing of the voltage regulator, causing interference and operation instability. Utility Meters: may record measurements incorrectly, resulting in higher billings to consumers. Drives/Power Supplies: can be affected by misoperation due to multiple zero crossings. Harmonics can cause failure of the commutation circuits, found in DC drives and AC drives with silicon controlled rectifiers (SCRs). Computers/Telephones: may experience interference or failures. When the reactive energy is compensated using power factor improving capacitors, which make parallel resonance with mains as transformers impedance at one of harmonic frequency the current can circulate between main supply and the capacitor current may exceed the rated current by more than double or triple its value. Above can be avoided by inserting detuned reactor in series with the capacitors prevent resonance; it can also be designed to reduce the level of harmonics by the following reactor system. here the reactor + capacitor combination is designed to resonate at a frequency of 210 to 220 Hz,again system resonances is avoided. This is suitable for variable loads where harmonic reduction is also required. In this systems the reactor + capacitor legs are tuned to a given harmonic frequency producing at almost zero impedance to that harmonic current therefore most of the current absorbed by the filter. This is suited for constant load. Note: In above all are passive systems which is parallel to the mains, it improves power factor, power quality & efficiency.